Director of Marketing and Special Projects for High Plains Journal and Midwest Ag Journal. Even though $700 million to $1 billion will be cut for the fiscal year 2013 budget of the U.S. Department of Agriculture due to sequestration, those cuts will be done as equitably as possible, according to Secretary of Agriculture Tom Vilsack. 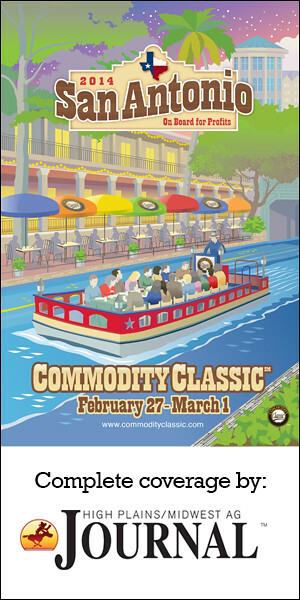 Speaking before the general session of the Commodity Classic March 1 at Kissimmee, Fla., Vilsack laid out three principles that ran through the departmental decisions to cut funding for everything from crop insurance, feeding programs and livestock processing inspectors. Those principles, besides equity, include being disruptive to as few parties inside USDA and to users of USDA services, and to be fair in the furloughing of USDA employees. As part of the sequestration agreement between Congress and the Obama Administration, $85 billion will be cut from the federal budget-primarily from defense and agricultural spending-as of Midnight March 1. Congress, meanwhile, left for a weekend recess on Feb. 28.